. . . the Manchester Road Race, even though I’m not around to participate this year. 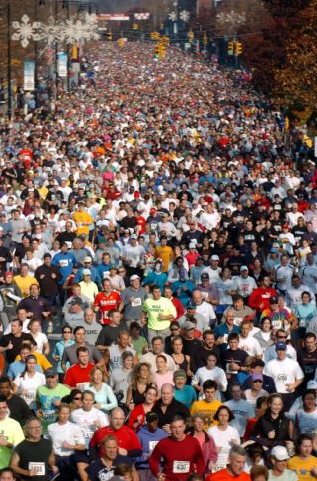 It’s such a wonderful feeling of community – almost 14,000 participants and 15,000 – 20,000 spectators last year! It’s such a great way to kick off the holiday season. Oh well, MAYBE next year.
. . . family. This year we’ll be spending Thanksgiving in Contoocook, New Hampshire at my Aunt & Uncle’s house (Rick and Ginny). Also in attendance will be my cousins, Matt & Amy (Boston), cousins Jon, Will, Dan, Jess & Baby Evelyn (New Hampshire), and Aunt Beth & Uncle Roger. I tried so hard to convince my parents to fly up, but it’s just so hard to pull off air travel during the short Thanksgiving break. Maybe next year.
. . . friends. We’ve hosted for the past 5 years or so, and we’re sad to not be inviting our friends into our home this year for Thanksgiving, but we’re happy to be able to bring some of our friends to eat with our family in New Hampshire.
. . . Ryan. Today more than ever. Tomorrow more than today. This entry was posted in Fall, Family, Friends. Bookmark the permalink. 2 Responses to I’m thankful for . . .
love you, miss you, see you soon! have a happy thanksgiving! friends…the family you get to choose! OH My, the race was crazy this year. More runners and spectators than ever. They actually ran out of bibs this year and people were running with no bibs. so crazy! Hope your turkey day was wonderful!